In a secluded palace lived Eros, the lonely god of Love whose arrows caused anyone they pierced to fall in love. Youngest of three daughters was the kind and beautiful Psyche, so beautiful that she made Aphrodite jealous. Aphrodite instructed Eros to cast a spell on Psyche with a potion that would make men avoid her in marriage. He did so but accidentally pricked her with one of his arrows and then in the impending chaos pricked himself with another. Eros was saddened by the prospect of Psyche’s fate and sprinkled her with a second potion that would give her joy in life. Psyche’s days were happy yet lonely and her parents feared she would never wed so they asked the Oracle at Delphi for advice. He told them that no man would have her but there was a creature that lived on a mountain that would marry her. Confused and desperate she climbed to a high precipice. There Zephyrus, the gentle west wind, took pity on her and carried her away to the palace of Eros. Eros never permitted Psyche to see him as he felt she would be frightened by his huge, um, wings. It gets a little predictable after this, they’re in love, she goes home to see the family, the jealous sisters tell her Eros is a monster, back at the palace she grabs a dagger and lamp and sneaks into the room at night to see the handsome god with wings, drips oil on him, he wakes and takes off. She is crushed, throws herself in the river, is rescued by Pan, asks Aphrodite for help, she has to do a list of tasks the final one kills her, Eros turns up, prods her with his "love arrow" and she awakens, Eros convinces Aphrodite and Zeus to make her immortal then they all party. In his bid for King of Crete, Minos decreed that the crown had been ordained to him by the Gods. As proof he said that anything he wished for would come true. He prayed to Poseidon for a bull to appear from the sea (go figure). He promised that upon its appearance the bull would sacrificed back to Poseidon. But Minos, the not so sly, decided he would keep the bull and sacrifice another. Bad mooo-ve. The big bountiful bull was sent into Minos’ herd whereupon Poseidon became boiling mad. He caused the monster to go berserk and ravage the kingdom. The poor denizens of Crete suffered the rampages of the Cretan Bull and only found relief when the mighty Hercules vanquished it as one of his labours. Minos’ punishment was made worse by Poseidon when he cursed Pasiphae, his wife, to fall in love with with the grand bull. Obsessed with lust she commissioned a model of a seductive cow to be built and positioned herself inside the bogus bovine as she awaited the bull’s attentions in the field where it grazed. The upshot was that a wild bellowing son with the head of a bull and body of a man was conceived. He lived, confined in the Labyrinth where young men and women were sacrificed to him until the hero Theseus slew him. … but the Mighty Hercules, strength of ten ordinary men, had a few anger management issues and often hurled himself into a battle of wits unarmed. Driven mad by Hera, who tormented all of her husband Zeus’s bastards, Hercules slew his own beloved wife and children. When he recovered his sanity he wanted to pay penance and asked Pythia, the Oracle of Delphi how best to atone for his sins. The Oracle advised him to go to Tiryns in Mycenae and serve his cousin King Eurystheus for 12 years where he might perform whatever labours the king asked of him. Hercules loathed serving this man, his cousin, whom he knew to be favoured by Hera and one so inferior to himself. But, afraid of angering Zeus, who favoured him, he complied. Eurystheus ordered Hercules to perform ten labours but because he was such a whiny pissant he disqualified two and added two extra upping the tally, in all fairness, to 12 Herculean tasks. best he just hang him from a tree by his feet. Foot, AKA OEdipus, and in this home he grew to manhood. now recall, was his Dad. So, Oedipus moved to Thebes. the people of Thebes made him their new king… and he married the queeeeen. found the termination of his wretched life. 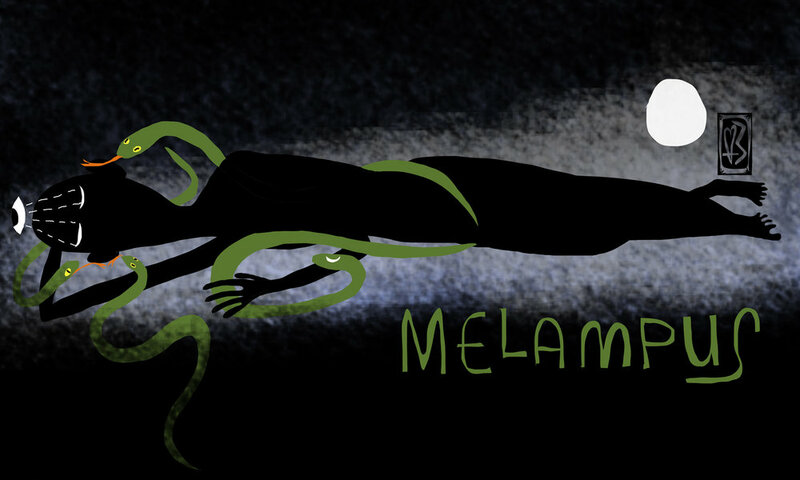 Melampus found a nest of young snakes under an oak tree and nurtured them carefully. One night as he slept the sneaky little dickens licked his ears. When Melampus awoke he was astounded to discover that he possessed a new ability to understand the language of birds and creepy things, he became a soothsayer, one of the first and foremost. Yessiree! Medusa, thanks to Minerva, was furnished with a vile coiffure of snakes. Perseus defeated her terrible stony gaze through her reflection in Minerva's golden mirrored shield. He lopped off her head, poor girl, and thereafter slung it around with him to use it as his gruesome weapon. An encounter with Atlas, the Titan who held up the sky, ended badly for the giant who was turned to stone, seaweed of the Red Sea, bled upon by the head, was turned to coral and then that creepy, would be step-father King Polydectes was transformed into rock before he could marry Perseus' dear ma-ma. 90%, better than a risk. I almost wish I were sleeping in a tent tonight. Summer began clear and blue but wildfires and smoke have choked the beauty out of these summer days. Since April 1st, 2017, 965 wildfires have burned 636,773 hectares of British Columbia. We are looking skyward, awaiting the return of our "wet-coast" rains to revive and green us. Mermaid, Siren, a mantic creature like the Sphinx, with whom they have much in common, knowing both the past and the future. Their song takes effect at midday in a windless calm and by the charms of their music they detain travellers and make them altogether forgetful of their native land.